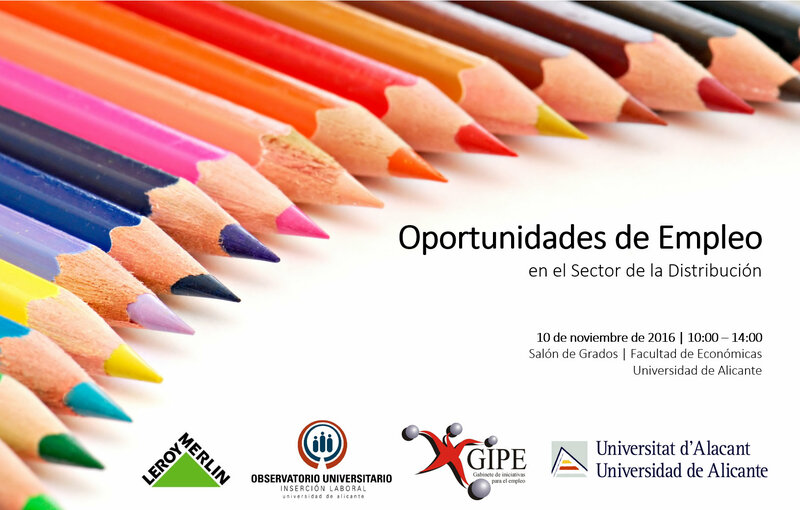 The next 10 November 2016, in the Living room of Degrees of the Faculty of Economic of the University of Alicante, will llevar the day "Opportunities of Employment in the sector of the distribution". Through this activity pursues give to know the opportunities of employment and professional development in the sector of the distribution, as well as the form to operate of the companies of the sector in front of the new challenges that have to face. 10.00 %u2013 10.30 | Opening and welcome | Institutional Presentation Leroy Merlin. Diary of the Day. Julián Barrasa. Manager RRHH Region Raise. 10.30 %u2013 11.15 | Construction of a mark Omnicanal. Francisco Marín Gonzálvez. Director Tend Elche. 11.15 %u2013 11.45 | Rest. 11.45 %u2013 12.30 | Project of growth. The manager in Leroy Merlin. The mission of the manager in the gestión of the business and the construction of the team. Programs for the incorporation of Talent. Joséª M Gil Quinzá. Director Tend Alicante. 12.30%u2013 14.00 | Tables of debate. 14.00- 14.15 | Farewell and closing of the day. You can inscribe you to the day through the following link.